For information about my translation services, please visit the main site. Pour des informations sur mes services, merci de regarder le site principal. Para información sobre mis servicios de traducción, visite el web principal. Journalists have been struggling with the pronunciation of Catalan place names in the aftermath of last week’s tragic events in Catalonia. Strangely, sometimes the names of places in Catalonia and the rest of Spain are pronounced as if they were French, with a nasal vowel creeping in to place names that begin with “Sant”, for instance. This phenomenon is known as a hyperforeignism. Journalists should not be expected to pronounce place names exactly as they are pronounced in the original language, but the purpose of these tips is to offer the best compromise pronunciation, i.e. a pronunciation that uses sounds that we use in English. In other words, it would sound pretentious to pronounce the r of the French city Rennes out of the back of the throat, like the French do, but it makes sense to avoid pronouncing the final s, since it is easy for an English-speaking person to do so and it does not sound unnatural. I’ve refrained from using phonetic symbols to make this guide accessible. A linguist will spot inconsistencies in my “transcriptions”, but they’re intended to be read by English speakers as if they were English words. The syllables written in all caps are the stressed syllables. The letters uh indicate a schwa sound, like the initial a in the English word about. Barcelona: This one’s easy. I think we can consider this one to be Anglicised, like Paris (in which we pronounce the s, even though it is silent in French). So just pronounce it the usual English way. But whatever you do, please don’t pronounce the letter c as a th! It sounds pretentious, and although it is part of the Spanish pronunciation, in Catalan, the c in Barcelona is pronounced as an s, just like in English. Recommended pronunciation: [bar-suh-LO-nah]. Cambrils: Another easy one for English speakers. Read it as written, including the final s. The stress in on the final syllable: Recommended pronunciation: [kuhm-BREELS]. Sant Sadurní (d’Anoia): I’ve put the final part in brackets because, although it is part of the official name, it is usually left out, in the same way that Newcastle-upon-Tyne becomes Newcastle. The pronunciation is quite straightforward. Note that in Catalan and Spanish (unlike in French), accented vowels indicate the stress, so Sadurní is stressed on the final syllable. The only other thing to note is that the final t of Sant is silent in most Catalan dialects. Recommended pronunciation: [SAN suh-dur-NEE (duh-NOY-a)]. Sant Just: Like in the above, you can drop the t, so Sant is pronounced [San] (don’t make it sound like the French word Saint!). The j of Just is pronounced like the s in vision, or the j in words borrowed from French, like jus. Recommended pronunciation: [SAN JOOST]. Alcanar: The main mistake I’ve heard with this one is a stress on the first syllable; it should be on the final syllable. The final r is silent in standard Catalan, but is pronounced in the accent of the people living in that part of southern Catalonia. Recommended pronunciations: [uhl-kuh-NAR] or [uhl-kuh-NA]. Subirats: The important thing here is to place the stress on the final syllable. All the letters are pronounced. Recommended pronunciation: [soo-be-RATS]. Ripoll: No, it doesn’t sound like the English word ripple! The double l produces a sound that doesn’t exist in English and is hard to pronounce. But we can get close enough by pronouncing it like a letter y. The stress is on the final syllable. Recommended pronunciation: [ri-POY]. Vilafranca (del Penedès): There are several places called Vilafranca in the Catalan sprachraum, but since this one is the biggest, Vilafranca del Penedès is often shortened to Vilafranca. The pronunciation of the short form is straightforward; English speakers will even relax the unstressed vowels in the same way that a Catalan would. If reading the long form, the word Penedès is stressed on the final syllable, as indicated by the accented vowel. Recommended pronunciation: [vi-la-FRAN-ka (duhl puh-nuh-DES)]. Pau Pérez: Not a place name, but the name of one of the victims. The first name should be familiar to basketball fans, thanks to Pau Gasol. I’ve written it as “pow” in the recommended pronunciation. Note that this should rhyme with cow, not with bow. In the surname Pérez, the first syllable is stressed, as indicated by the accented vowel. It is a Spanish name, so most Spaniards (including Catalans) would pronounce the z as a th sound, but in other parts of the Spanish-speaking world people would pronounce it as a hard s sound, so this would also be acceptable. Recommended pronunciations: [POW PEH-reth] or [POW PEH-ress]. Have I missed any out? Leave a comment below, or tweet me, and I’ll add any other places you’d like to know how to pronounce. Is your Internet connection running mysteriously slow? Perhaps you’ve noticed that it’s only slow when one computer is connected to the network? That’s what happened to me today. While testing my wireless router in different parts of the building to see if the signal improved, I eventually realised that the connection was only slow when the router was connected to my desktop computer. Because the desktop computer is connected to the router using an Ethernet cable, it wasn’t connected while I was moving the wireless router around the building, which is when the speed improved. As soon as I reconnected my desktop computer, I noticed that the speed went down again. I then investigated what was using up all the bandwidth on that computer, concerned that I had some malware running in the background. 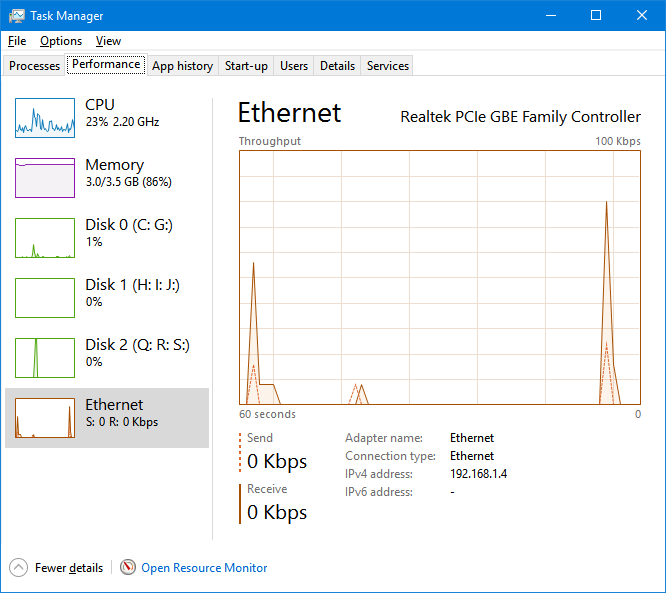 To do this, you can press ctrl+alt+del and open the Task Manager, select the Performance tab, then click on “Open Resource Monitor” at the bottom of the window. Once in the resource monitor, open the “Network” tab, and you’ll see a list of the processes that are sending and receiving data. 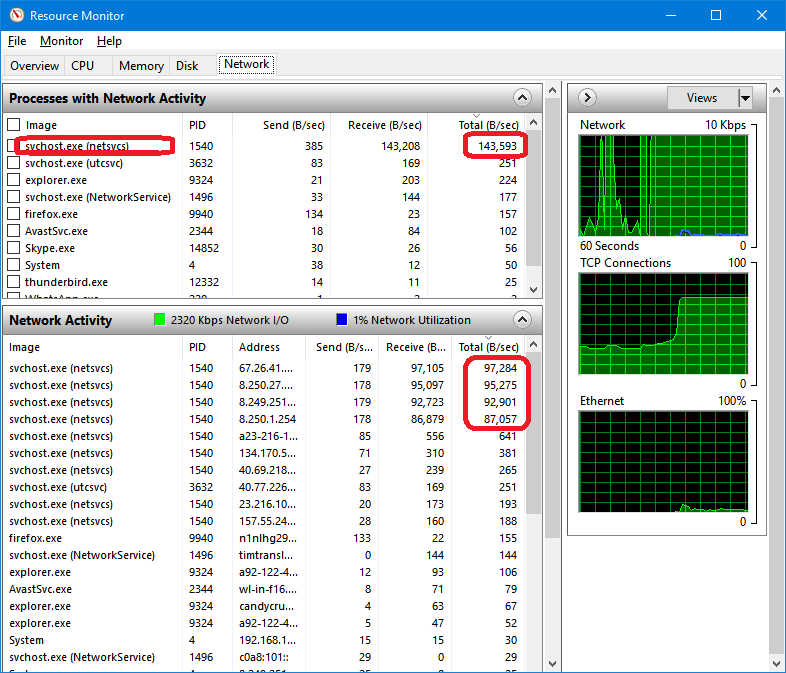 If the bandwidth is being consumed by Windows Updates downloads, you’ll notice that the amount of data being downloaded by “svchost.exe” is far higher than what other processes are downloading, as in the screenshot below. 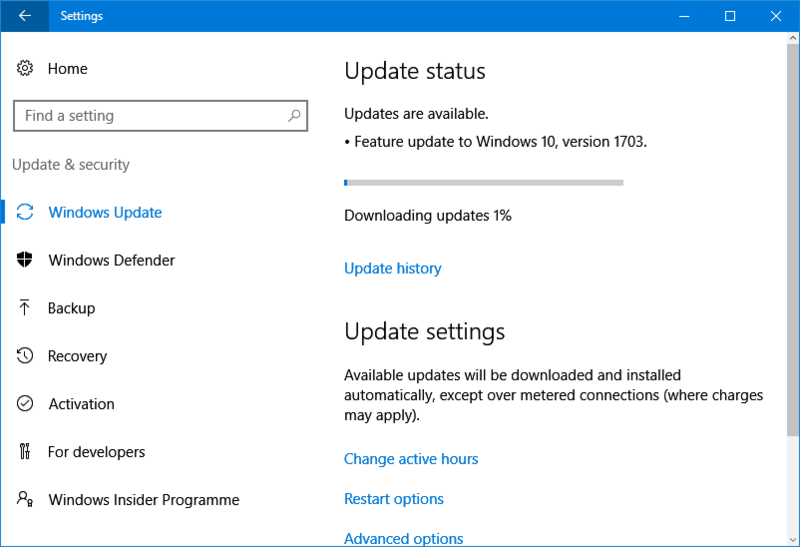 You can double-check whether Windows is doing updates by opening up the start menu and typing “Update”, then clicking on “Windows Update Settings”, which will open up the window shown below. This will also show you how much of the update has been downloaded. If you’ve already downloaded 98%, you might just want to let it finish, as the procedure described below will mean that you have to restart the download when you want to download the update. If you’re connected to your router wirelessly, then you could tell windows that your connection is metered. However, this may affect the behaviour of other software and prevent you from getting important software updates (which are generally much smaller, so they won’t take up bandwidth for hours on end). Also, Windows says that it delivers certain essential updates even on a metered connection, much to the chagrin (as evidenced by comments on numerous forums) of many users of metered connections, especially in developing countries where Internet usage per megabyte can be very expensive. If you’re connected using an Ethernet cable, you can’t mark the connection as metered. Many websites will tell you commands to stop the update service. 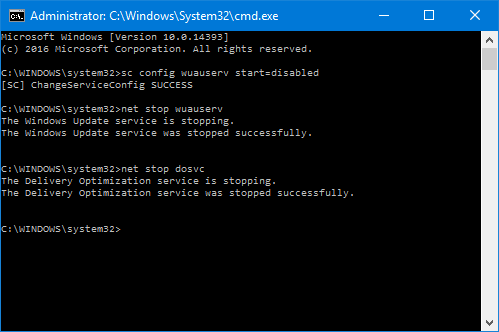 The problem, though, is that since the “Anniversary” update of Windows 10, the service restarts itself, so we need to use an additional command to stop the service from automatically restarting. First, open a command prompt as Administrator. To do this, open the start menu, type “cmd”, then press shift+ctrl+enter. Your command prompt should now look like the following screenshot. You can now close the window if you wish. In the resource monitor, you should now begin to see the network activity of “svchost.exe” decrease. The number does not disappear immediately, as Windows calculates the download rate over the past minute, but wait 60 seconds and you should see the amount of data being downloaded by svchost.exe fall to less than 100B/sec. Welcome to the blog of Anglo Premier Translations. The purpose of this blog is to provide information to purchasers of translation services and tools for translation services providers. For high-quality, professional translation services, please visit our business website.